Climbing up and down the back alleys of Tsfat’s Old City this past Shabbat, I came across the Garden of Eden. The courtyard of a secluded home containing an orchard bursting with fruit trees. But not your average, puny grocery-store lemons. 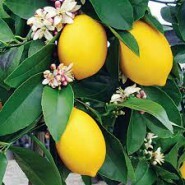 Tree after tree of the most glorious and luscious lemons I ever saw. Rabbi Zelig Pliskin writes in Life is Now: “In every life there are moments of setbacks and disappointments. “We create our character by the way we handle defeat and failure. “It is in moments of great challenge that we have the greatest opportunity to elevate ourselves, by facing the difficulty with inner strength and courage. “The spiritual awareness that the Almighty is with us and gives us the inner resources that we need to prosper and thrive will sustain us when we face adversity. “…Eventually the pain of the setback subsides. We come back to ourselves. That quality that enables us to grow from our most painful moments is known as resilience. A funny choice of fruit trees, I thought, as I stood staring at this hidden, acidic Garden of Eden. And a very Jewish choice as well. A reminder of Hashem’s love within every test in life. A burst of sweet within all sour.